Phil Sklar and Brad Novak do not have a Milwaukee location picked out yet for their 2016 planned National Bobblehead Hall of Fame and Museum. What’s more, their very ambitious Kickstarter campaign – which ends at midnight tonight – is going to fall well short of the $250,000 goal. But just like all those times Pete Rose used to thrillingly try and stretch a long single into a double, it’s head-first and full speed ahead for the pair’s genius idea. In the long run, only paid members of the museum will get to vote on bobblehead Hall of Fame inductees, with four planned each year. 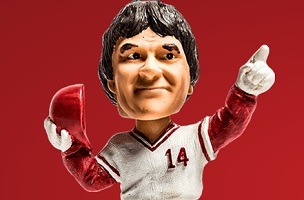 But to build up awareness and excitement, the duo are allowing, one time only, both members and non-members to vote online on this epic bobblehead question: Should Pete Rose be the first inductee? Rose is up for it, and so far, the Yes’s are far outweighing the No’s. Sklar and Novak recently hooked up in with Rose in Las Vegas (per the excerpted interview below) and have talked to him about a neat idea relating to his potential induction. Sklar, a CPA and MBA who recently quit his day job to focus on the Bobblehead project full-time, says the museum collection has quickly raced past the 3,000 mark. Teams are passing on remnants; individuals are donating items; and with a companion website launched late last year, the fun has only just begun. Speaking of fun, outgoing MLB commissioner Bud Selig, who officially wraps things up January 24, works out of offices located in Milwaukee. So the pair sent over a Selig bobblehead and a rose, hoping perhaps also to get him to comment on this Hall of Fame campaign. There was no comment. Sklar says that although the Kickstarter goal will not be met, the campaign allowed him and Novak to make many valuable connections, including some with potential museum sponsors. He also shares that at one point, in what was surely a gag, someone emailed to say that they would fund the entire Kickstarter amount if there was a guarantee that Rose would never be put in in the bobblehead Hall of Fame. Real or in effigy form, Rose continues to be a hot topic.